Last week we covered two common methods for pricing your services. That post went over the basics of pricing. These basics will help you make a go of things as a small plumbing, HVAC, or electrical business owner—but to get to the next level and really boost your profit margins, you need to consider another vital factor: value. 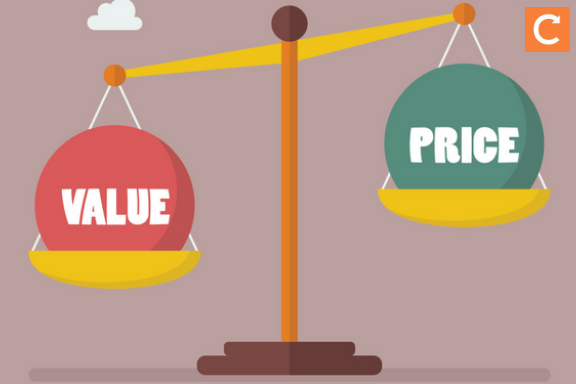 Here's how to make sure your prices reflect the value you offer your customers. How do I set prices based on value? Here are the basic steps to charging what your services are truly worth to your customers. Know what value means. It's not the time you spend on a job! Set your base hourly rate using your business expenses, desired wage, and hours worked. Figure out pricing that reflects the value of each type of job. You can charge more for an after-hours emergency job! Consider other factors that determine customer value. For example, your location plays a role in how much people will pay. Put it in writing. A pricing document will ensure your prices are clear to customers. Now, let's get into the details on each of these steps. And for even more help, download our free pricing calculator just for field service businesses! How setting prices helped us keep our clients happy. We experienced problems at Commusoft when we didn't carefully consider our service and prices beforehand. One example: When we first started, a new client signed up and immediately asked us for on-site training. It was something we’d never done before so we had no set prices—or pricing documentation. We just estimated our price based on what we thought clients would pay. The result? We undercharged. We lost money. Even worse, clients didn’t respect us. They didn’t believe that they were getting a good deal; they only thought it was a cheap price, which is not the same thing. Because we didn’t have pre-set pricing documentation, this led to clients trying to negotiate with us on our already low offer. They could sense we were unprepared, so they started haggling. So we spent some time looking at what it cost us to offer this service. We then considered how much value we provided to our clients’ businesses. Finally, we looked at what our competitors charged. Based on this information, we came up with a sensible price and created beautifully branded PDFs explaining our onsite training service, why it’s valuable, and how much it costs. Guess what happened? Clients requested information and all we had to do was confidently sent them the PDF. Customers not only stopped haggling, but their respect for our product and service also skyrocketed. Here's how you can experience the same pricing success. That's the kind of statement that comes up over and over from small business owners. But this approach to pricing is based on the value engineers think customers perceive from their service—not the value customers actually perceive. In reality, the value the client places on your service is not based on your time. It's based on the usefulness of having a properly functioning tap, or having heat in the winter! It's based on having an expert fix their toilet so they don't have to DIY it—and possibly make it worse. Some customers might spend time looking for a cheaper service, but most are willing to pay well to get the job done efficiently and reliably. Customers also place a lot of value on transparency and professionalism. The engineer who takes a deep breath and says, 'I can do it for £20' might very well be an excellent workman—but he'll come across as a cowboy! Set your base hourly rate. That doesn't mean the solution is to take that random price and double it. Spend a little time understanding your business’s costs to decide on a base hourly rate. Last week's post can help you with that. Once you’ve done that, you’ll then need to decide on whether you want to charge hourly (rounded up to the next nearest hour), or in 30-minute, 15-minute, or six-minute increments. This will depend on the type of jobs you do. Set prices based on the value of each type of job. Always consider more than just hourly labour. A standard PAT test with 25 appliances should be priced differently from fitting a new alarm system! Surprise: If a boiler service takes 30 minutes and your hourly work rate is calculated at £45.00, it's not sensible to charge £22.50. You need to consider customer value, as well as whether it’s even worth your time doing a job for £27.00. Remember, the value to the customer is unrelated to your time. The value to your customer isn't how much time you spent, but that they now have a boiler that won’t break down. That's where call-out charges and standard service fees come in. A call-out charge makes sure every job is worth your while, and a standard service charge aligns your price to take into account customer value. So in your Terms and Conditions you might state that a standard boiler service costs £65.00. That makes it crystal clear to the customer, and it’s these sorts of jobs that will give you a good margin. Consider other factors determining customer value. The right service charges will vary depending on where you are in the country and the type of customer you serve. For example, in general clients in London will tolerate significantly higher prices than clients in Liverpool. However, you should never underestimate how much additional value your business can provide through improved service and reliability. People will always pay more for someone they trust more to do a good job! Let’s say the customer is a busy, single professional who works in the City of London and cannot be at home to admit you to his premises until 7 p.m. His perception of value is going to be very high if you're willing to send an engineer at that time of day. He doesn't need to take time off work or get a friend to babysit his flat. By contrast, a pensioner who is in all day won't pay more than your lowest standard charge. Once you've calculated an hourly rate that reflects the value you offer, write up a pricing document with your Terms and Conditions to send out to your customers when a job is booked, so you’re clear and up front about your charges. Need more help with pricing? Download our free pricing calculator. Just click on the banner below and you'll be seconds away from charging what you're worth.